Cosmoe Harlow, foreground, and Chris Stikes fold up tepees as Culture Camp is dismantled. 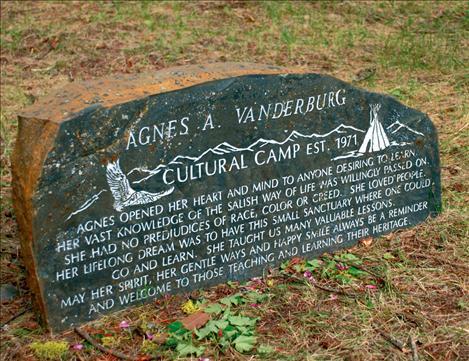 An inscription at Culture Camp honors Agnes Vanderburg, who began the Culture Camp on her property. Eva Boyd, master basket maker, splits cedar with her fingers. 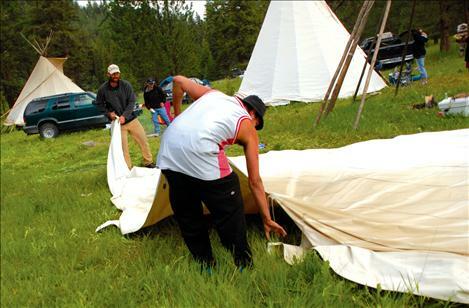 NORTH VALLEY CREEK — Encampment at Agnes Vanderburg’s camp is part of summer at Salish Kootenai College, and this year it was held from June 9 to 14. Although it always rains, this year they only had one day of rain and some showers — not enough to slow down the students, who showed up with tents and campers or lived in tepees provided by SKC. About 30 college students signed up for the four-credit encampment or culture camp, SKC Art Department Chair Frank Finley said. That’s a little low, Finley said, but with faculty and families, camp numbers swelled to about 75 people. While it sounds like a busy time, most students commented on the peaceful feeling in camp. 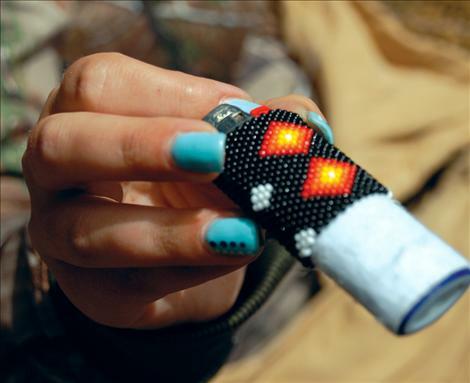 While beading a peyote stitch lighter, third-year participant, Holli Wilson said her favorite thing about encampment is listening to stories from the elders. Winona Pierre said she enjoys her time at encampment. 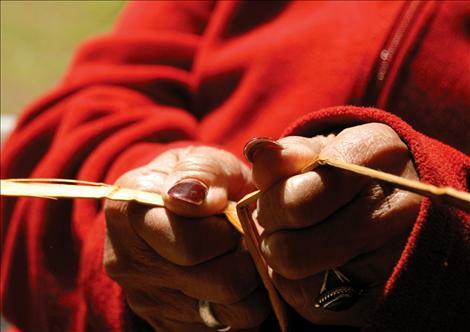 “It’s calming,” Pierre said, slipping beads on her needle. Leticia Rides at the Door commented on all the people from different tribes and their families helping each other out. Each student spent at least two hours with each instructor and was required to complete three projects. 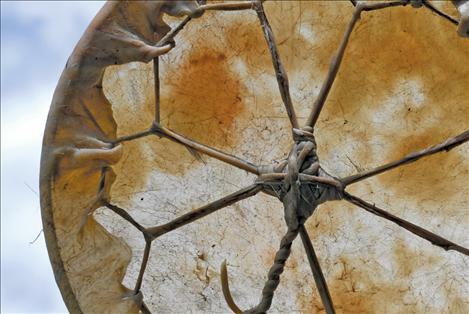 Instructors were Rachel Bowers and Geraldine McDonald, beading; Eva Boyd, sally bags and baskets; Dwight Billedeaux, flint kapping, drum making and shield construction; Karolyne Rogers, flute making; Finley, net and twine making. A veteran of the Encampment, Bowers has been coming to camp since 1969. She cooked when she first started coming and slept in the back of the station wagon. “Agnes had some tents and a big tepee. We’d go in there at night and tell stories,” Bowers said. After breakfast was finished, Bowers said she’d go over and get the hide tanners started and then work with the drum makers. 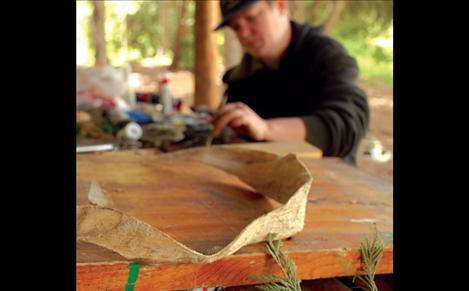 Rogers, a psychologist from Coeur d’Alene, has been coming to Encampment for 16 years. The first six or seven years, she paid her dues and helped out. Then she began teaching. 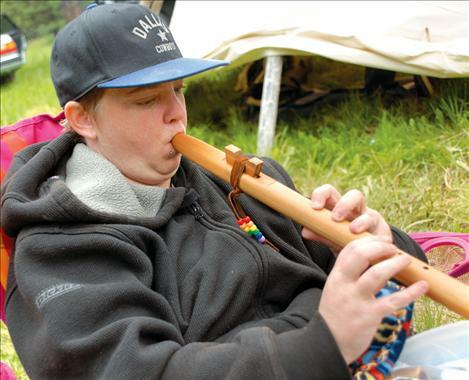 Rogers heard a man named Bob Two Hawks, a Lakota, play the flute and “got very interested in playing the flute.” Then Two Hawks became ill and was dying. “In his dying process, he taught me to make flutes and asked me to pass it forward,” Rogers said. “I asked him ‘Bob, have you noticed I’m white?’” she said, laughing. Rogers said the process of learning to make the instrument was more important than the outcome, and she stressed that with her students. Miranda Luttrell said she started with a long rectangle of wood before Rogers showed her how to shave the wood down and sand it to become a woodwind instrument. Luttrell also made a flute case, stitched by hand. On Sunday night, Joe Santos, Jr., who has been a camp hunter for three years, shot a bull elk, providing the camp with wild meat to make into dry meat and a hide for tanning. With many hands, the elk was cut up in five hours, and then it took about three days to dry the meat. Santos said they used cottonwood and mountain maple. If the cottonwood is wet enough, the wood will smolder, which is ideal. “You want to dry it (the meat,) not cook it like a burger,” Santos said. As always, culture camp is heaven for children, who run, jump and play pick up games of double ball. Incashola said she could, but she brought along a bathtub for the youngster as well as her grandson, Alias. Incashola cooked for the group with help from the students. Rain showers, camping, fresh air and no cell phone service as well as learning cultural ways of doing things seemed to make the Encampment fun, since many folks were staying on for another day just to enjoy the peace and quiet.